Victoria, BC, Canada – Reliable Controls is pleased to announce the release of the SMART-Sensor™ Electronic Paper Display (SS3-E). The SMART-Sensor delivers a stylish, modern, networked sensor solution that allows for connecting with up to ten configurable parameters related to a space. The updated SMART-Sensor design is centered around a new electronic paper display (EPD), a low-profile, plastic and glass enclosure, with capacitive touch buttons. The SMART-Sensor is a powerful and dynamic microprocessor-based sensor that monitors room environmental conditions, and communicates the information back to MACH-System™ controllers via SMART-Net™. The interface clearly indicates object name, value, and equipment status. Even third party BACnet® objects connected to the Reliable Controls MACH-System can be accessed directly from the EPD screen. All SS3-E models include touch buttons and an onboard thermistor for space temperature sensing. Options include CO2 sensor, front light, humidity sensor, I/O, and enclosure colors in warm gray or white. The SS3-E is fully compatible with the existing SMART-Net networks. 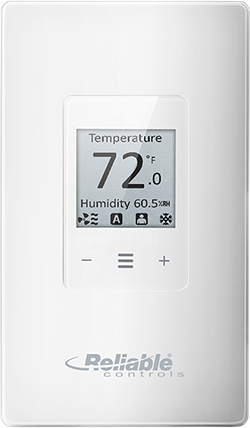 New features include a degrees C/F switch accessible from the SMART-Sensor user interface, multiple language support, and an expanded set of status icons. The SMART-Sensor hosts an onboard language library containing over 90 common industry words and phrases in seven different languages. Users can select from English, French, Spanish, Portuguese, German, Italian, or Simplified Chinese.